And I thought Sunday mornings were for a lie in. Aston had other ideas and woke me with a bowl of meringue he was whipping. Time to get up then Nannie! Whisk the egg whites in a clean, dry bowl season with salt and black pepper, whisk until soft peaks. Spoon onto a piece of parchment paper on a baking tray and make a hollow in the middle with a spoon. Drop the egg yolk in the hollow. Cook on 100C degrees for 7 mins. Meanwhile chop your onion finely and start to cook in a little olive oil add your minced pork and cook for about 3 mins or until cooked. Add a little dark soy and your oyster sauce. 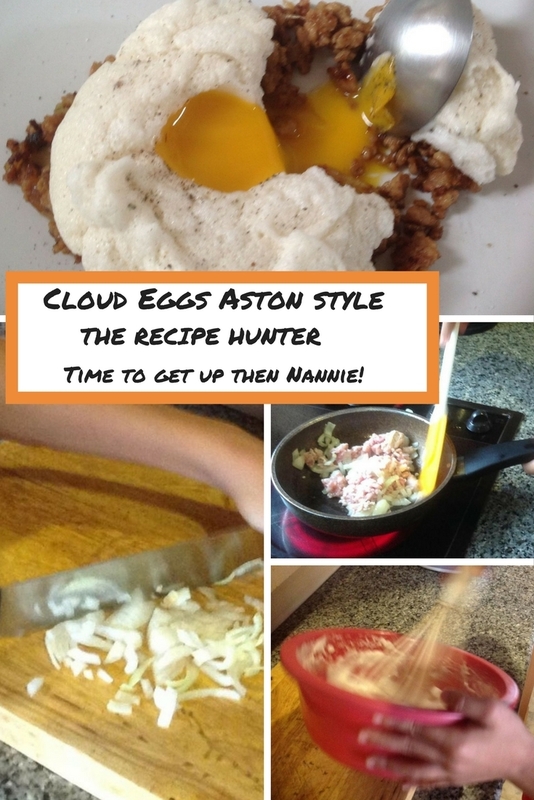 Put on a plate and top with your cloud egg. This was Aston’s recipe as he loves his meat so thought he would just do some mince and onions to go with the cloud egg, an experiment really as he is already thinking he will make some additions that next time, by adding Chilli and some green beans. He has some imagination when it comes to food, but he is a 12-year-old with a passion to cook.